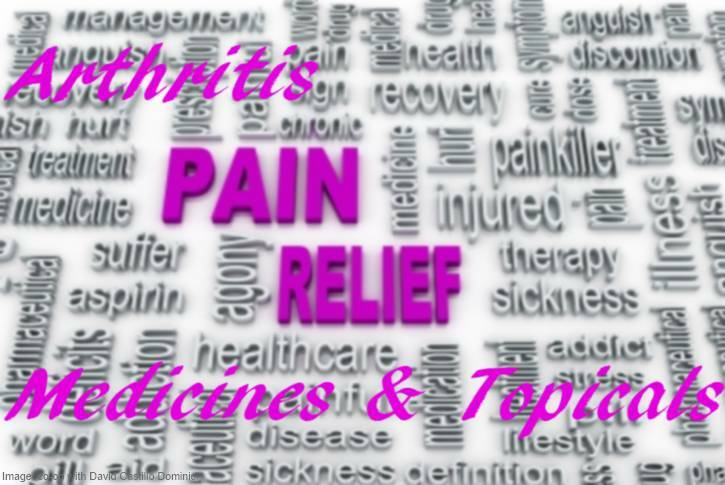 Arthritis pain relief with medications and topicals, a lot of people benefit from. Arthritis pain relief medicines reduce pain in muscles and joints. These medicines have their own characteristics and some types of pain may respond better to them than others. And as with a lot of things in life, each person may respond a bit different to certain medication. In general, these Over-The-Counter (OTC) drugs can be divided into Acetaminophen drugs and Non-Steroidal Anti-Inflammatory drugs. - Tylenol Extra Strength Acetaminophen Caplets. - Anacin Fast Aspirin & Caffeine Pain Reliever, Coated Tablets. When taken as directed there usually shouldn't be side effects. Mind that you don't take any other Acetaminophen drug, as too much of it may cause liver damage or even death. Max. is 3,000mg per day. So talk to your doctor if you have a history of liver disease, alcohol or drugs abuse, or when using blood thinner Warfarin (Coumadin). Besides reducing pain, these popular NSAID medicines which are derivatives of salicylic acid, also reduce joint swelling and inflammation, or signs of it, such as redness, swelling, fever. They kind of block enzymes in the body. The enzymes support so-called prostaglandins which are components that play a role in inflammation and pain. Examples of these Non-Steroidal Anti-Inflammatory Drugs are Aspirin - max. 4,000 mg per day, for max. 10 days for pain, and avalable under brand names such as Bufferin, Bayer, Ecotrin, or as generic versions or store brands. Aspirin makes the blood a bit thinner. - Bufferin Buffered Aspirin Pain Reliever/Fever Reducer - Coated Tablets. Possible side effects of Aspirin might be discomfort, pain, drowsiness, dizziness, abdominal cramps, heartburn, nausea, headache, feet swelling, diarrhea. It is always wise to talk to your doctor if you want to use these drugs. You also have the COX-2 inhibitor, named Celecoxib - which mainly blocks COX-2, - max. 400 mg per day for Rheumatoid Arthritis (RA), is available under brandname Celebrex. This anti-inflammatory drug reduces the symptoms of arthritis without endangering the stomach and kidneys. Ibuprofen's, Naproxen's and Celecoxib's possible side effects might be discomfort, pain, drowsiness, dizziness, abdominal cramps, heartburn, nausea, headache, feet swelling, diarrhea, high blood pressure, ringing in the ears, ringing in the ears. When considering Ibuprofen or Naproxen and are sensible for gastrointestinal side effects, you might take a COX02 inhibitor such as Celecoxib instead, or other stomach protective medicine. Over-the-counter (OTC) topical formulations for relieving arthritis pain may be helpful for your knees, hands, fingers, ankles and elbows, but to a much lesser degree for your shoulder, hip or back pain. By the way, here's more on arthritis compression gloves for your hands. When choosing an OTC arthritis pain reliever - an analgesic balm, rub or salve - be sure that it contains the active ingredient Histamine Dihydrochloride, for example in Australian Dream arthritis cream , or the active ingredient: Menthol or Camphor, Capsaicin or Salicylates, see examples below. The meaning of analgenic = capable of relieving pain. - Icy Hot contains menthol, a combination of menthol and camphor, and a combination of menthol and methyl salicylate. Before applying an ointment or gel mentioned above, you could talk to your doctor about it. There might be side effects, drug interactions or incompatibilities with your health condition. The so-called sodium channel blockers such as lidocaine and prilocaine, work best for nerve disorders. These topicals numb nerve endings close to the skin, so you'll feel less pain. - Numb Master Topical Anesthetic Lidocaine Cream. These NSAIDs influence the joint fluid and reduce inflammatory proteins such as prostaglandins resulting in a direct anti-inflammatory and pain relieving effect. Advantage of applying Topical Non-Steroid Anti-Inflammation Drugs is that there may be less side effects than oral NSAID. It's supposed to lessen cardiovascular and gastrointestinal risks. An example of such NSAID is - Voltaren Gel is a topical formulation of the NSAID diclofenac, and is available only by prescription. Besides medicines and topicals, professionals recommend taking moderate portions of meat, fish, cheese, coffee, alcohol, sweet drinks and taking more vegetables, salads and fruits. Some people also benefit from drinking herbal tea. Good fats are also important for healthy joints. So try to take fat fish twice a week. Fish that's fat: mackerel, herring, eel, sardines, salmon, bloater, halibut. Eating Fish eases Rheumatoid Arthritis pain. Recently a study showed that more frequently eating fish - at least twice a week - may be associated with lower disease activity in Rheumatoid Arthritis patients. If you worry about the expiration date of a medicine, here's more on expiration dates. Data and prices are subject to change. This website is for informational purposes only and is not intended to be a substitute for advice from your physician or health care professional.